The steelmaking process generates by-products (process waste) and associated waste (product packaging etc). BlueScope Steel is committed to reducing the amount of waste going to landfill and has implemented a number of waste minimisation and recycling initiatives. These involve reducing the generation of waste materials, reusing waste materials in the steelmaking process and recycling waste materials offsite, in some instances finding alternative markets. These initiatives have significantly reduced the amount of waste going to landfill, which is now only used as a last resort. A whole range of innovative uses have been found for steelmaking by-products and associated waste, from road base, concrete and cement to garden mulch. At the Port Kembla Steelworks, a partnership has been formed with Australian Steel Mill Services (ASMS), where slag produced by the Steelworks goes to useful markets. 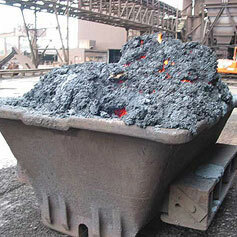 In recent years, slag has been used in the construction on roads, bridges and airport runways. ASMS aims to eliminate the need for on or off-site storage of slag by recycling 100 per cent of the slag currently produced by the Steelworks and also working through the stockpile created in previous years. Many steelmaking by-products are recycled into the steelmaking process, including dusts, greases and oils, and refractories. A number of associated wastes are recycled, including concrete, which is broken up and sold as aggregate, bulk plastic bags, and timber, which is either reused or mulched and used on gardens. Also at Port Kembla, Illawarra Resource Recycling, a consortium of local companies, has been formed to provide innovative waste solutions for the Port Kembla Steelworks and Springhill Works. In addition to further preventing waste, the Company's focus is now on the separation of waste where it is generated. By preventing mixing of wastes at the source, more effective solutions can be found for reuse and recycling. At the other end of the recycling spectrum, BlueScope Steel's Logistics offices around the world have put in place a process for recycling used printer cartridges. Slag is used in roads, bridges and airport runways.